Hi, long time lurker. 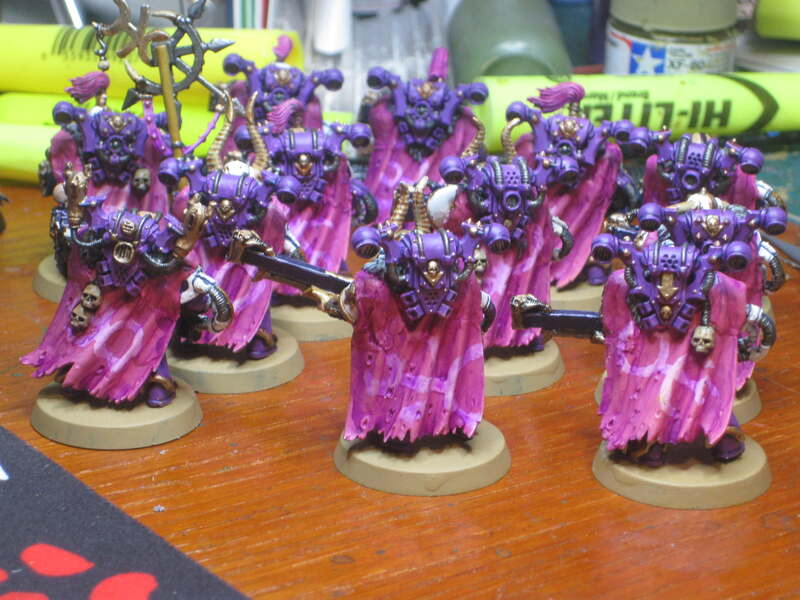 I'm currently building and playing an emperor's children army - I've got about 2700 points painted, and about 500 more that I've built and have yet to paint. I've recently run into a bit of a wall painting, so I've turned my eye to what I might build. 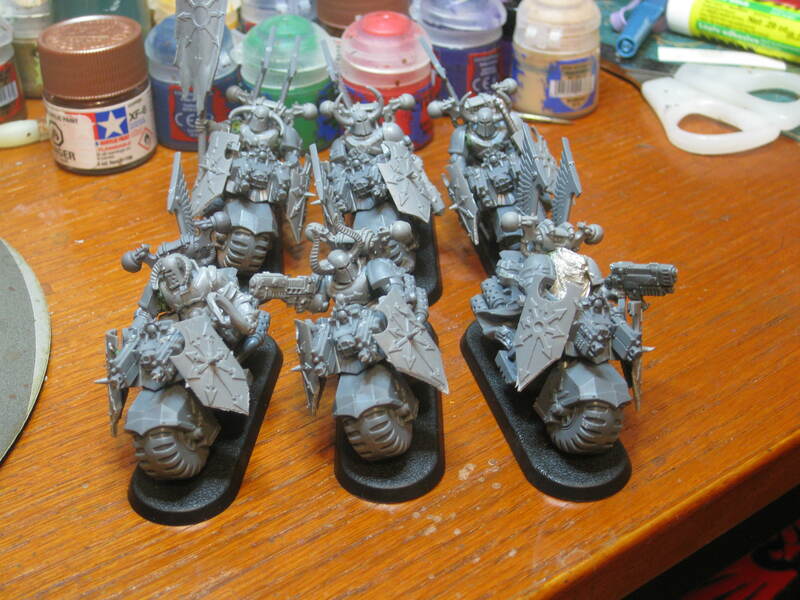 Recently, as I've been waiting for the bits for my second unit of noise marines to come (just got them today), I looked to what models I had unbuilt - which was basically the minis from my 2nd Dark Vengence box. 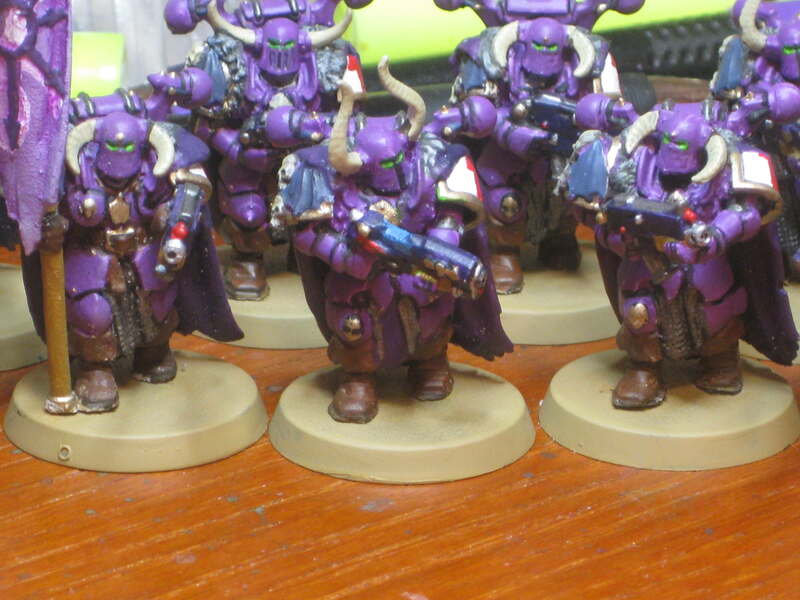 Given that I already had a set painted up "as is" without conversions (for the most part) I decided to convert up the second box so that I didn't have any identical models (well, except for the bolter guy that comes twice in a box). Despite still having trouble getting decent pictures (one reason I haven't shared more here - my photos have been awful), I thought that I would take and share some pictures of my latest work. 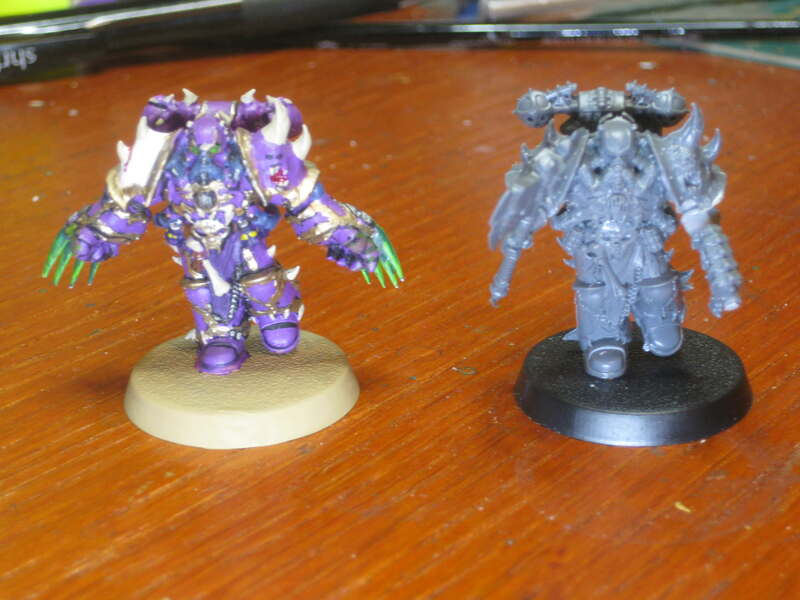 First is my converted hellbrute, here with his unconverted (mostly - I gave him a fist mounted heavy flamer) pal. And here he is on his own. Anyway, let me know what you think and I'll share some more soon. Edited by Dr_Ruminahui, 30 April 2018 - 03:37 PM. Love the double fist brute. 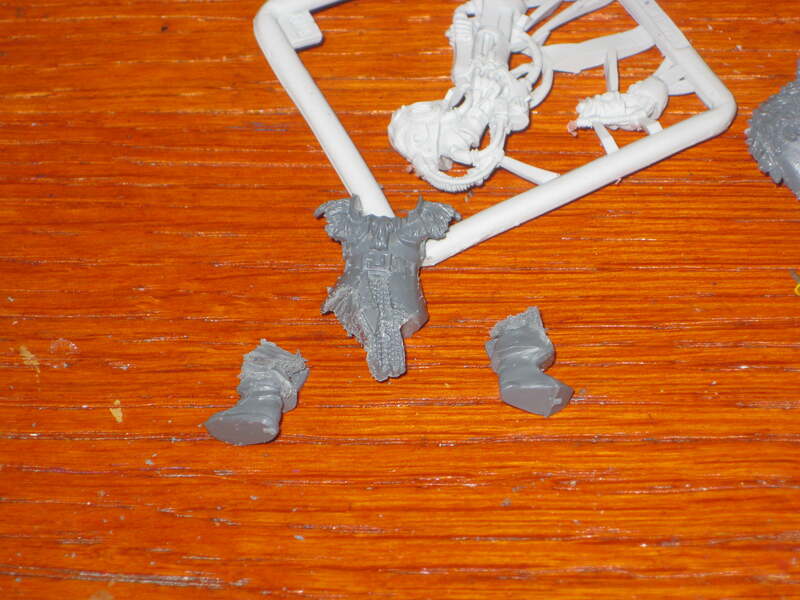 Are those Maulerfiend bitz? 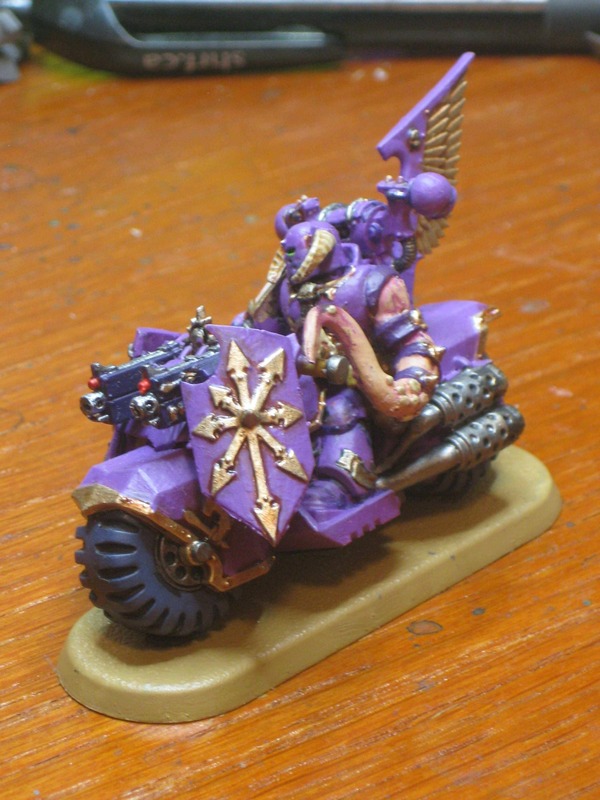 Nice conversion, intrigued to see what you've done with the Chosen. I was wondering 'where's the head' until I realized its a big eye just staring at its next kill. That just makes the hairs on the back of my neck stand up seeing that eye in what looks like a mouth with jagged teeth. Oh yeah. I personally would never model anything like that, but it is creepy as hell. Good job, OP. Edited by Iron Father Ferrum, 12 April 2018 - 12:46 PM. 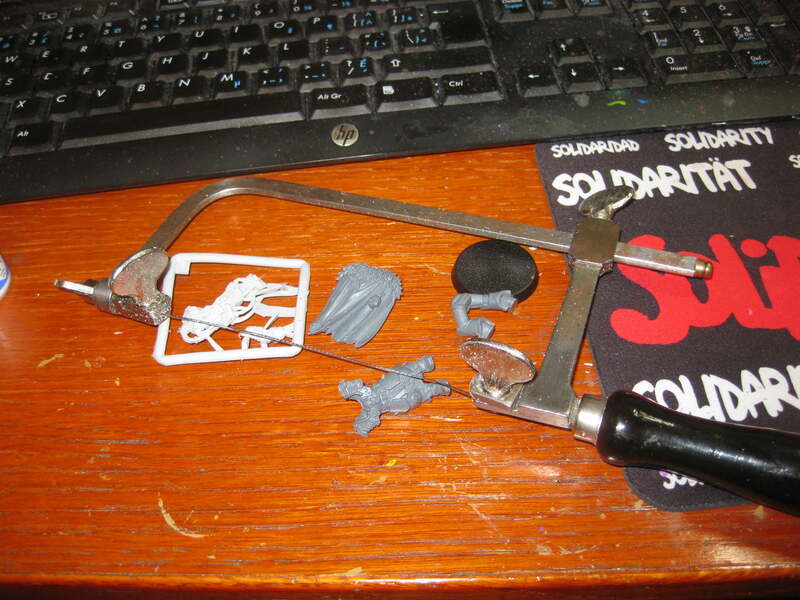 Cool stuff, that mauler/brute looks like a mean metal gorilla. Thanks! 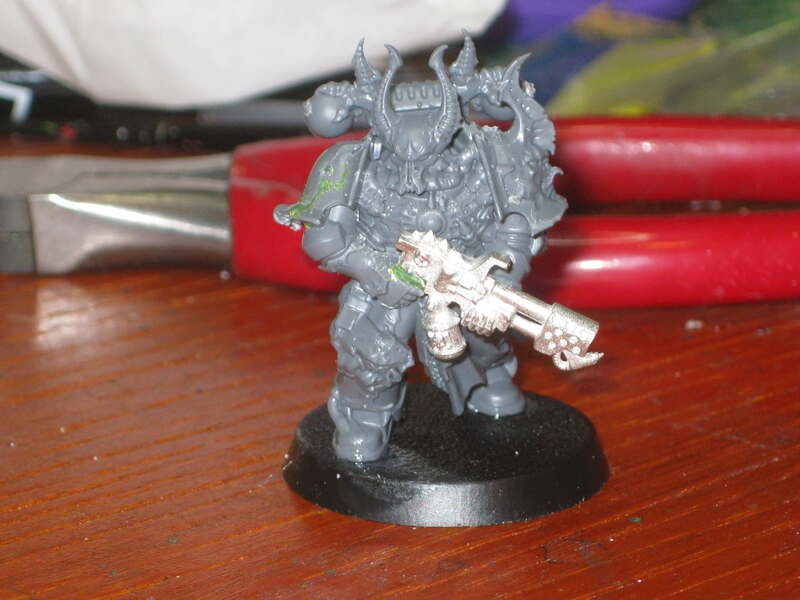 And yes (as noted by Dragonlover) those are the maulerfiend arms - I did my kit as a forgefiend, and while I magnetized the arm weapon options, I wasn't then confident enough in my magnet skills to magnetize the head, arms or other maulerfiend options - hence the left over arms. Glad you liked it! I should get some pics up of my Chosen over the weekend. 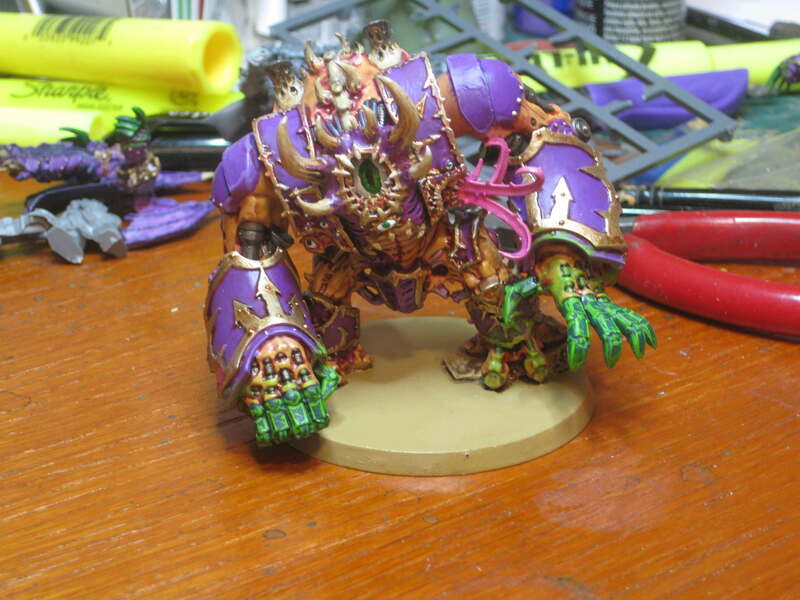 That's what my wife asked as well, when I showed it to her - that said, she asked the same about the regular Hellbrute as well. I went with the single eyeball as 1) it made the model look quite different and 2) the head from the kit is too right facing, and I wanted to reorient the model to be more centrally focused. Anyway, I'm happy with the response its triggered. 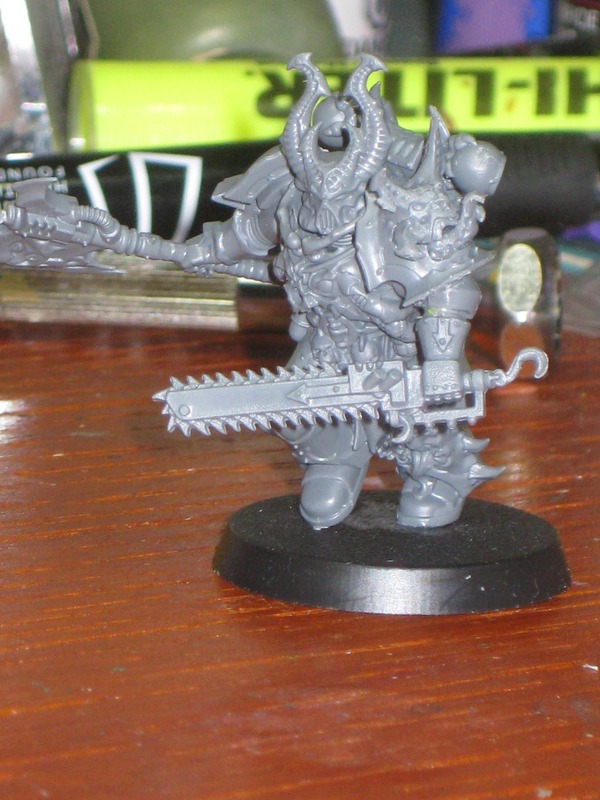 Yeah, I don't think I would have gone this direction either except that I love the new bio-mechanical models such as this and the forge/mauler fiend, and the dark vengeance hellbrute in particular doesn't really look like it should have a pilot inside. 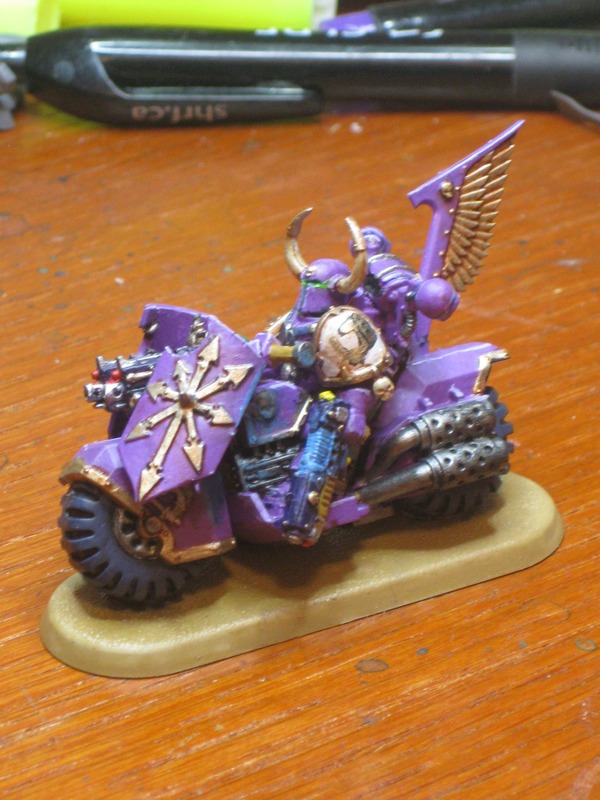 And that's one thing that I like about chaos marines is that there's so much room for different interpretations and aesthetics when making conversions. For example, some love the heavily mutated look of the dark vengeance chosen, while others prefer the cleaner look of using 30K models - and both visions and looks work within the aesthetics of the faction as a whole. And again, I'm glad that it got an appropriate emotional response. Thanks! That's kind of how I was thinking of it as well, especially before it was painted. 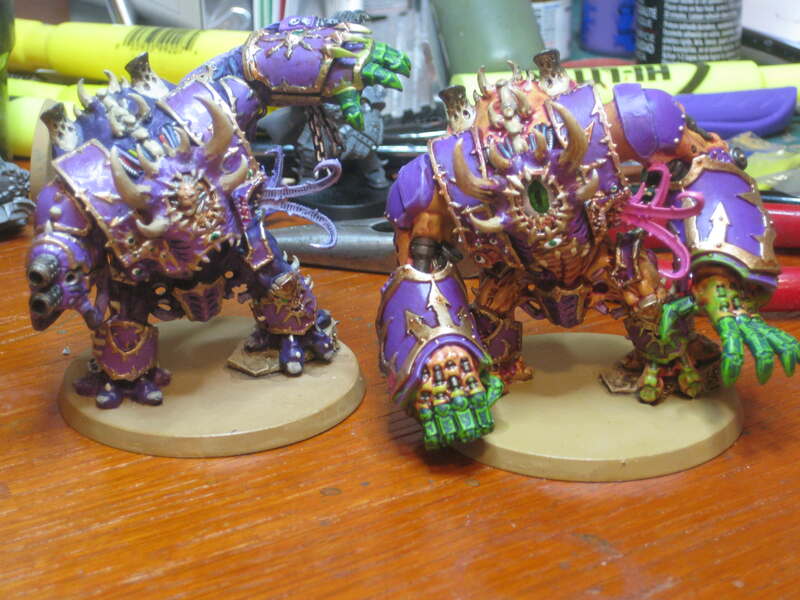 Anyway, thanks for all the encouraging comments - hopefully I can get decent pics of my other conversions up soon, though these won't be painted as I finished them this week. Edited by Dr_Ruminahui, 12 April 2018 - 03:44 PM. Glad you like it - and I look forward to seeing your own conversion if/when it is done. Took some pictures of the chosen conversions - enjoy! 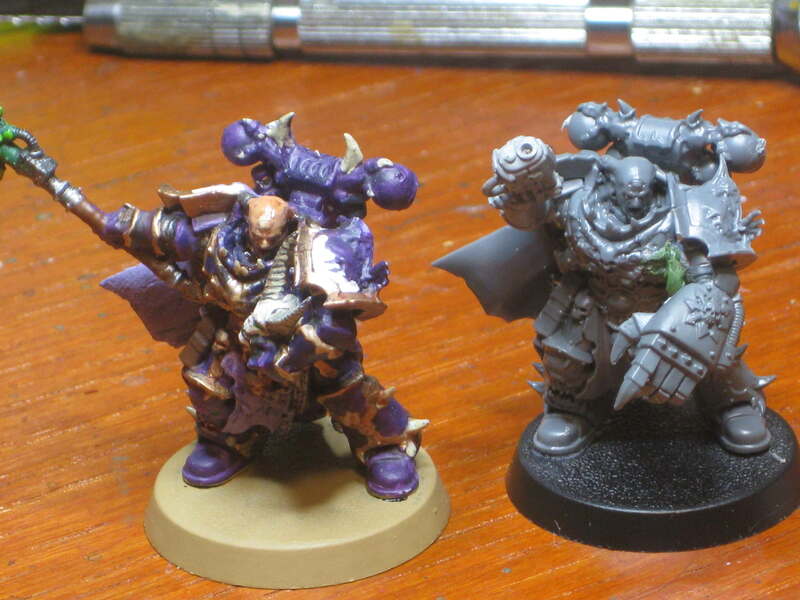 They are mostly just bits swaps between the models, with a few other (mostly CSM) bits thrown in. Next up will be the 3 character models. Bro, I love your purple! 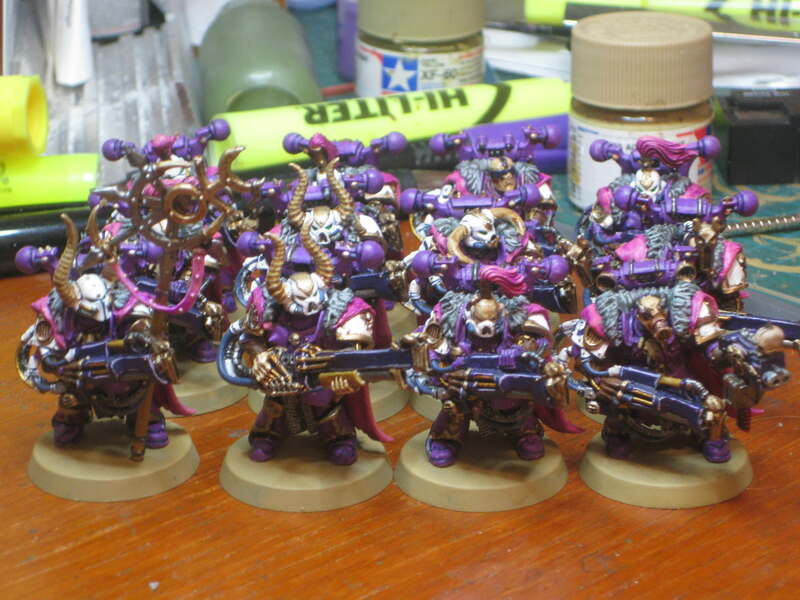 And as anyone who knows me will attest, I'm not keen on the plain old pink marines, another tangent for another day. Your converted hellbrute is beyond sick. I love the use of the mauler arms and that eye is great! What more FW bits do you got? I wanna see more. Moar! Awesome! Il be keeping an eye on this. 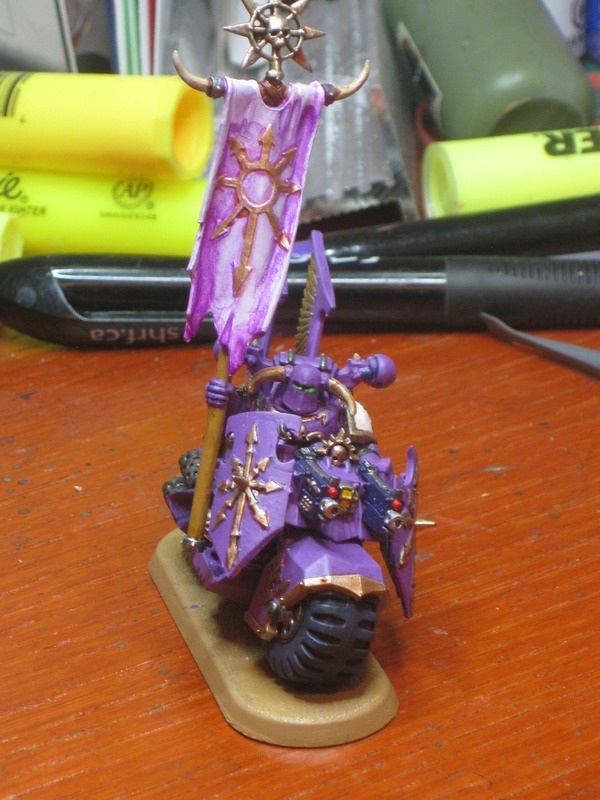 Im not a huge fan of the chaos range so I've been keeping my army low budget so I wont feel so bad when they are eventually replaced by nicer models. I converted my dv chosen into noise marines and am really happy with them! 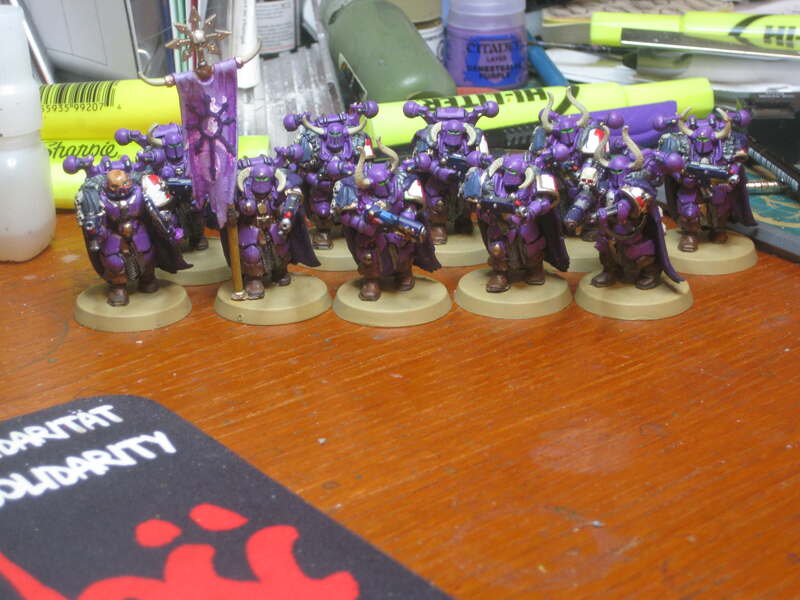 Glad you like the purple - I went about my army backwards, first painting them purple and then figuring out what legion they should be. While I too am not that fond of the pink and black scheme, I do like using pink as an accent colour. Thanks too regarding the hellbrute. Not sure about your question about "FW bits" as I don;'t have any FW parts. Do you mean DV (dark vengeance)? If so, more is on its way. Glad you like it! 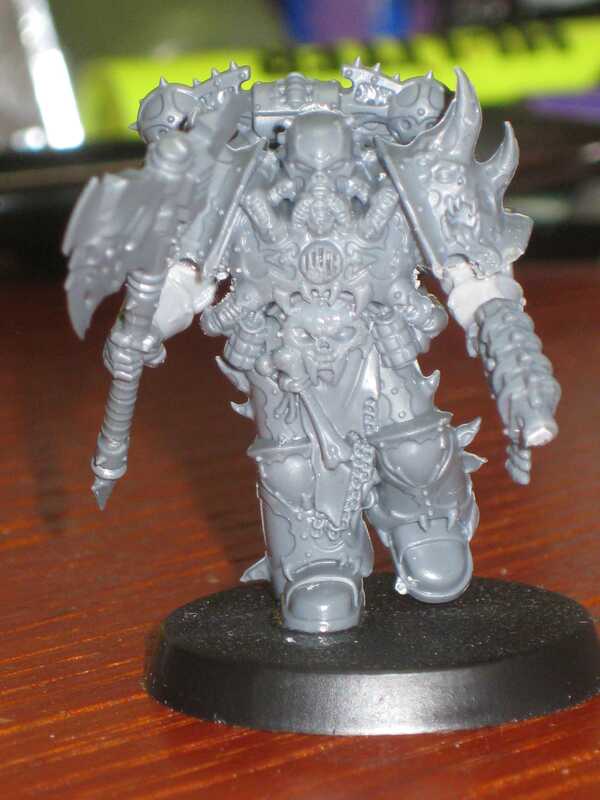 Please share picture of your conversions - I'm interested in seeing what you've done. 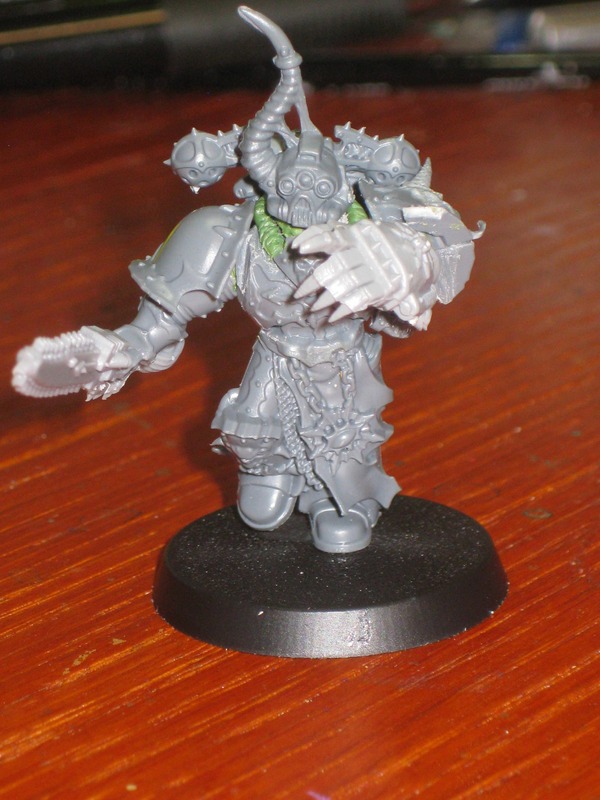 I've done my own noise marine conversions, using fantasy warriors - they should make it into this thread when I finish with my dark vengeance stuff. Anyway, now for my dark vengance characters. 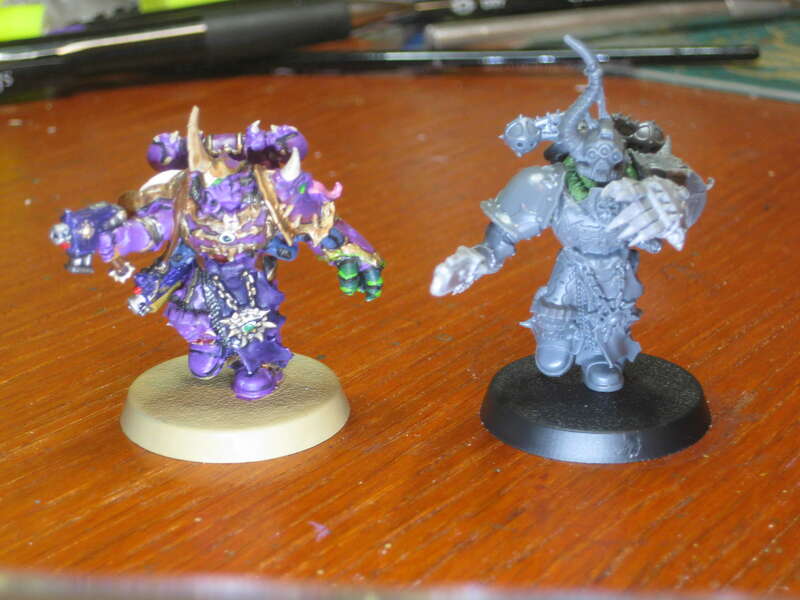 First, the one with the power maul - the painted version I field as a dark apostle, the unpainted one will be a chaos lord. 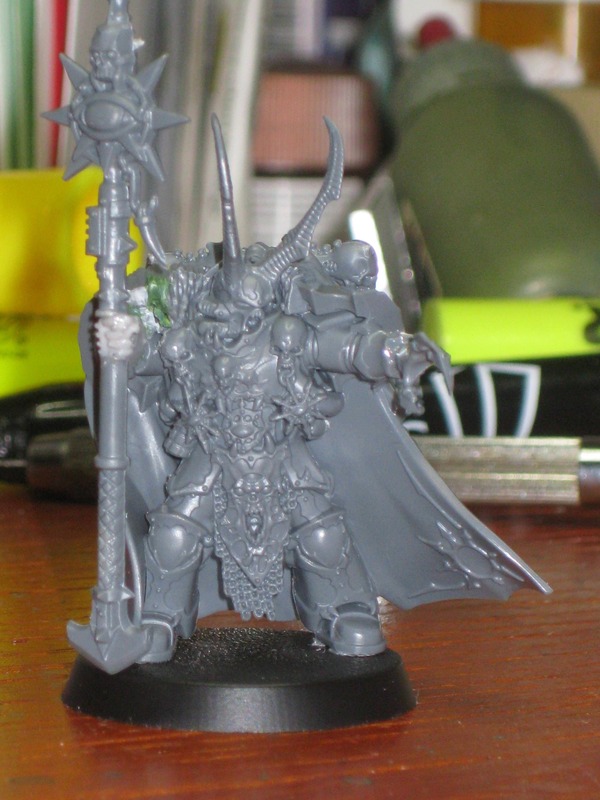 Second is what I think is a lord, but I field it as a sorceror - the new one will also be a sorceror. Last is the power axe guy, though both are converterted. 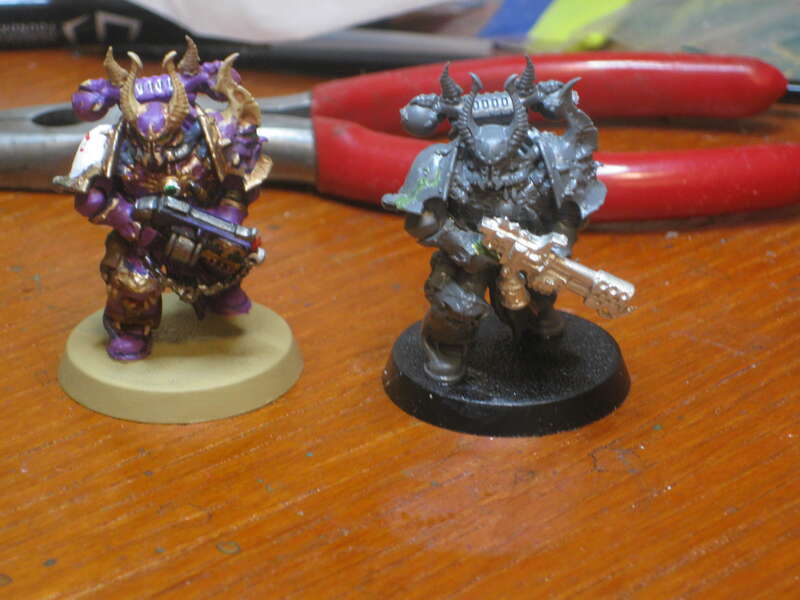 The painted one I use as a chainsword & bolt pistol chosen, the second I'll use as an exalted champion. Edited by Dr_Ruminahui, 14 April 2018 - 02:43 PM. 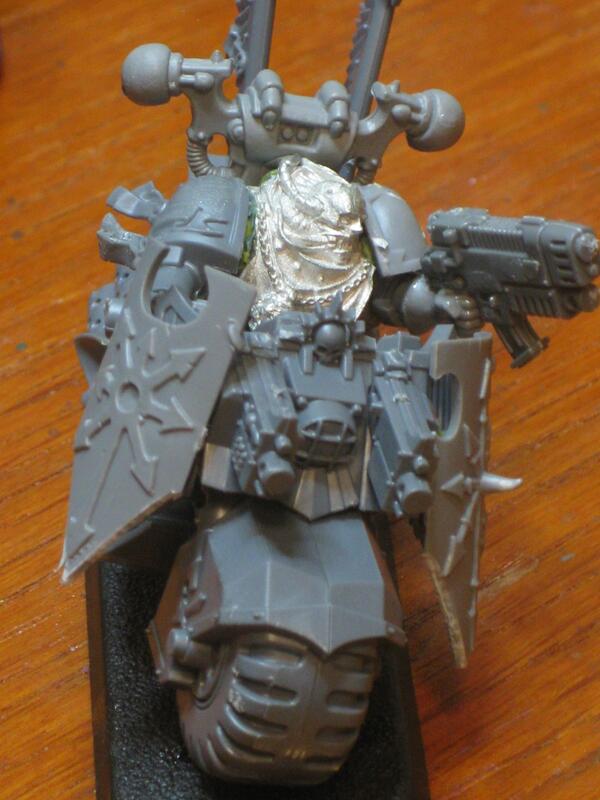 Loving the continued conversion work. I still have a set of the DV chosen I want to cut up and convert but have been dreading the hard work that goes into it. Thanks! I'm quite happy with them - especially the characters. Of course the FAQ just came out that allows me to give each of them a power weapon - ah well, gives me more bullet catchers I guess. I guess he got distracted - just because he's a 10,000 year old super soldier doesn't mean he has good gun discipline. Thanks! They actually aren't that hard, you just need a good saw (I would recommend a jewler's saw - best piece of hobby gear I was ever given, it even beats out my dremel) and some green stuff. When you do, please post pics - I'm interested in seeing what your vision for them is. 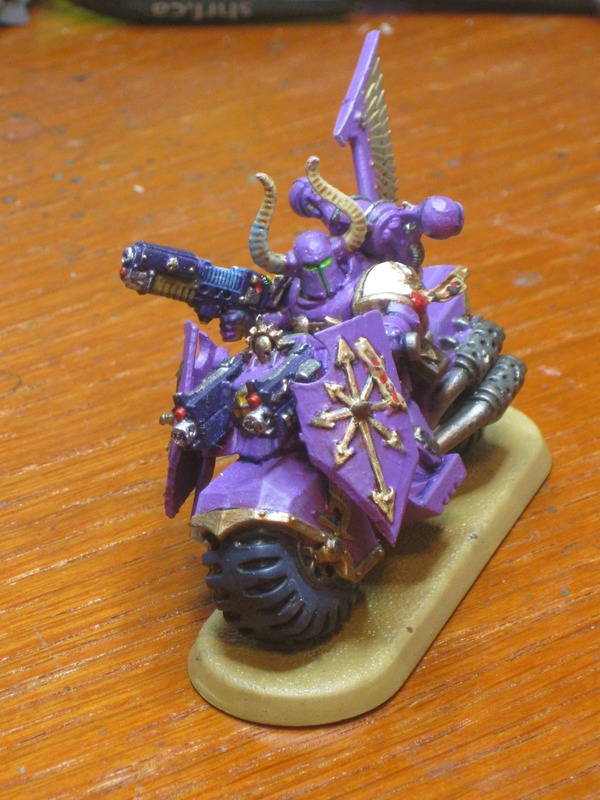 These are the last of my dark vengeance conversions, and this time it is loyalists who are being converted corrupted into emperor's children. Some of these I posted a while ago, so I apologize for the repeat. The banner isn't finished being painted - its essentially a place holder until I get my band's iconography nailed down. And here is a sneak preview of my next project. Edited by Dr_Ruminahui, 22 April 2018 - 12:16 AM. 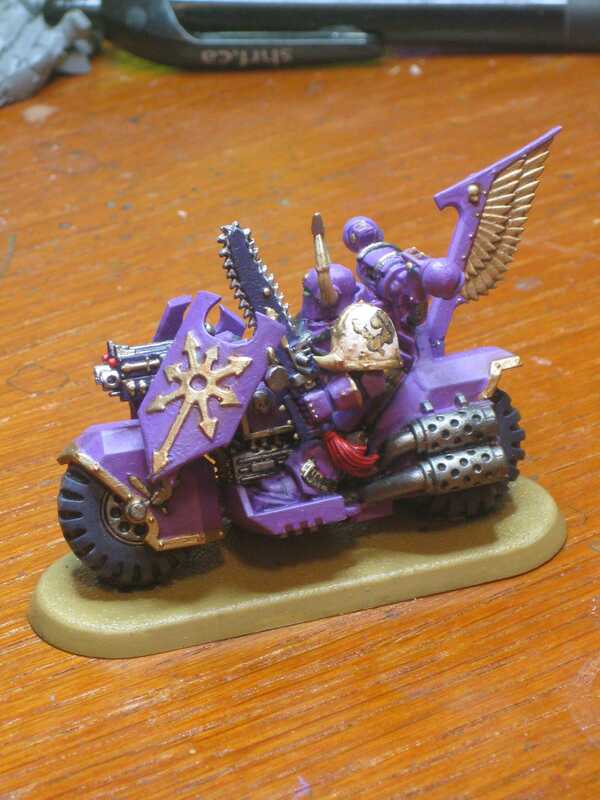 Nice work on the bikers, the use of the chaos shields is an interesting touch. Thanks! 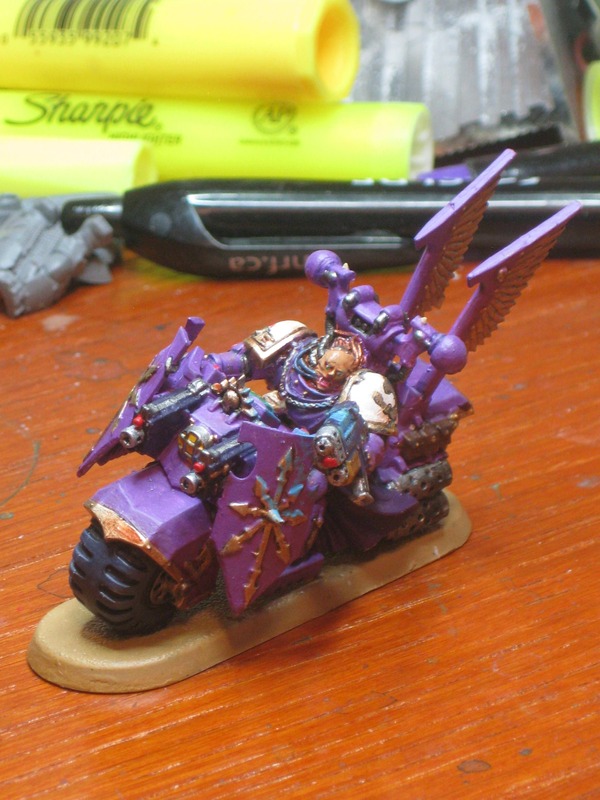 I thought the feathered "wings" on the back looked appropriate for emperor's children, but the wings on the front were too imperial - and since I had a bunch of chaos shields from using chaos warriors in some conversions, I used those to "chaosify" them a bit. No more dark vengeance minis for now (though the conversions above will be painted during ETL) so I thought I would show you what I am now working on. Anyone know how to change the thread title? 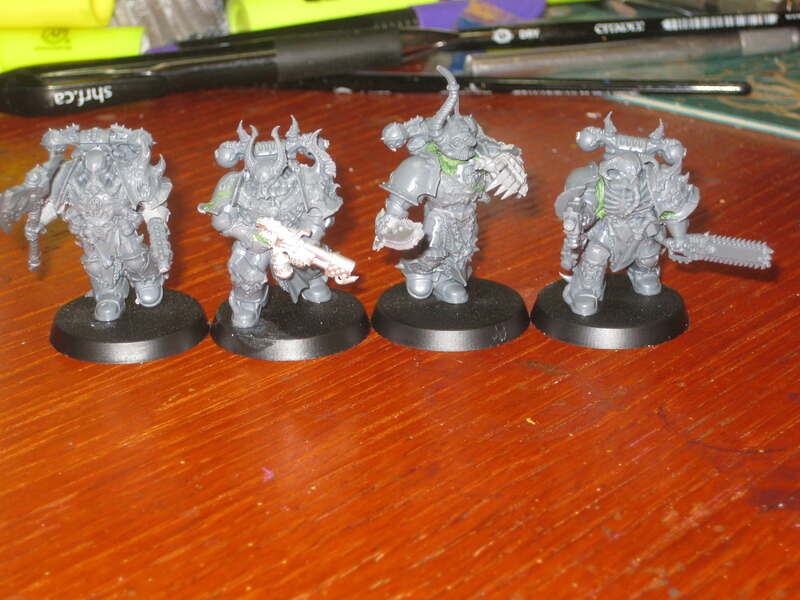 As I teased above, I am making noise marines out of chaos warriors. 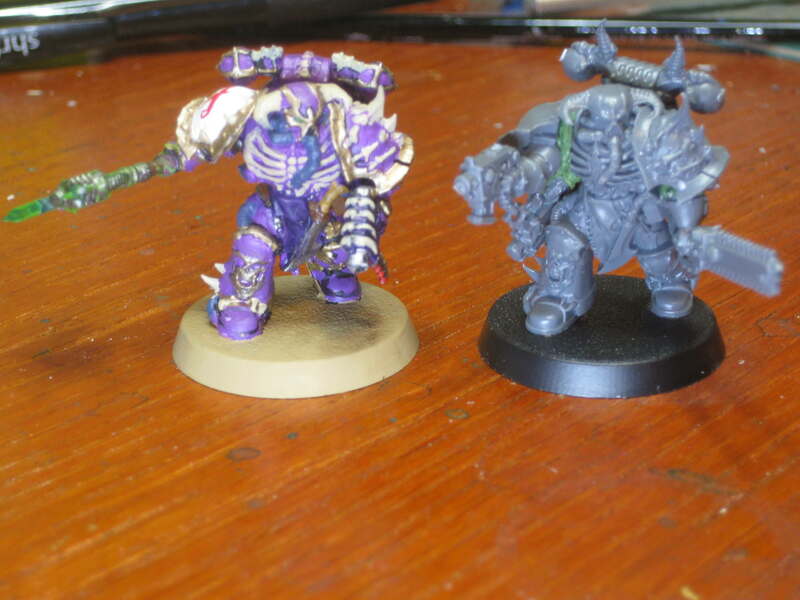 This will be the 3rd unit I have converted out of chaos warriors - I have another unit of noise marines and a unit of chaos marines. 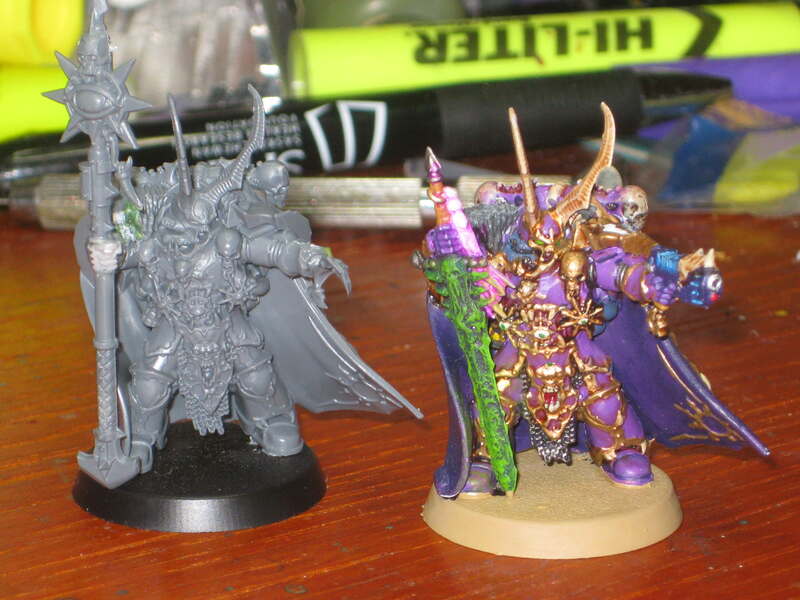 I have also done a chaos lord and a sorcerer by mixing warriors, metal raptors and fury parts. 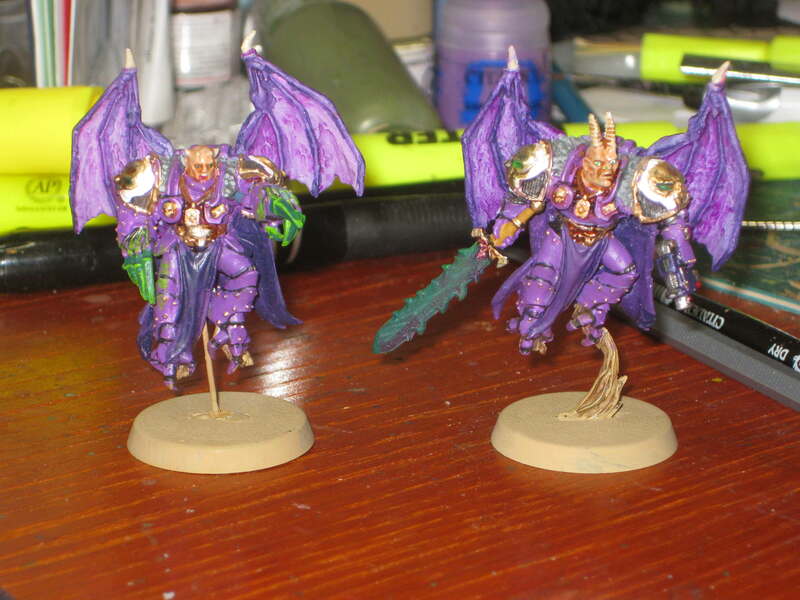 Here are my HQs using warrior and metal raptor bits, with metla fury wings - these were done some time ago, before there was the possessed box with similar wings. The one with the claws is my jump pack lord, while the one with the sword is a sorceror. 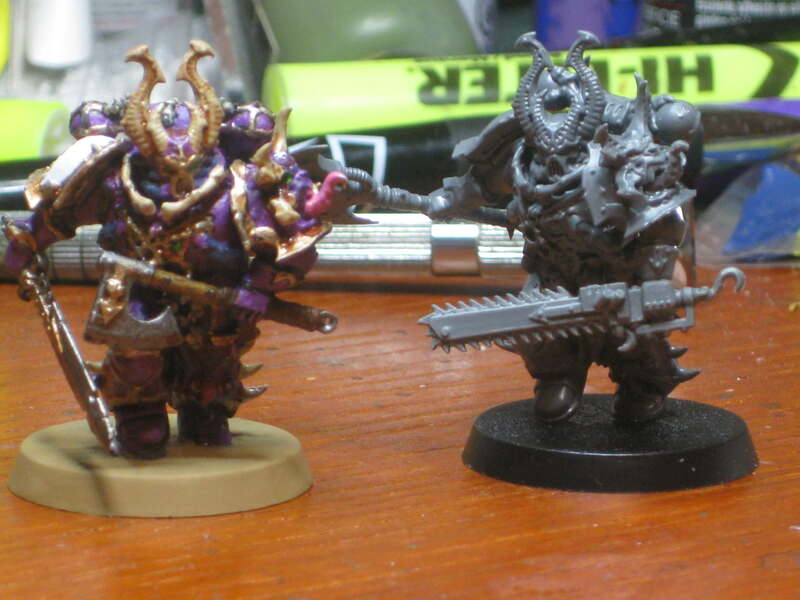 These next two are of my chaos warriors - I like how the original legs make them look like they are walking, but ultimately decided that they looked too much like fantasy minis with guns, so I've since used chaos marine legs instead. 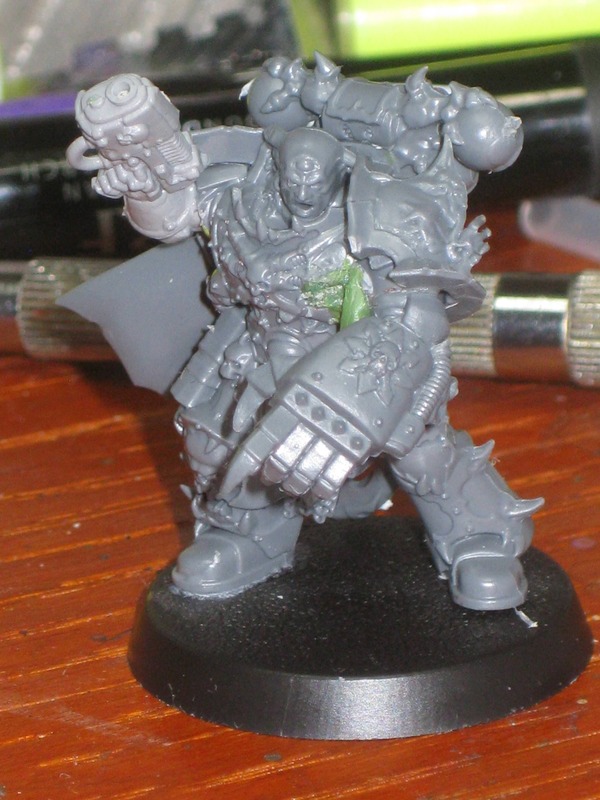 Last is my first unit of noise marines - I'm building a second unit of marines now, and planning on psoting a "how to" in this thread. No more dark vengeance minis for now (though the conversions above will be painted during ETL) so I thought I would show you what I am now working on.&nbsp; Anyone know how to change the thread title? When you edit the first post, you can change the name there. 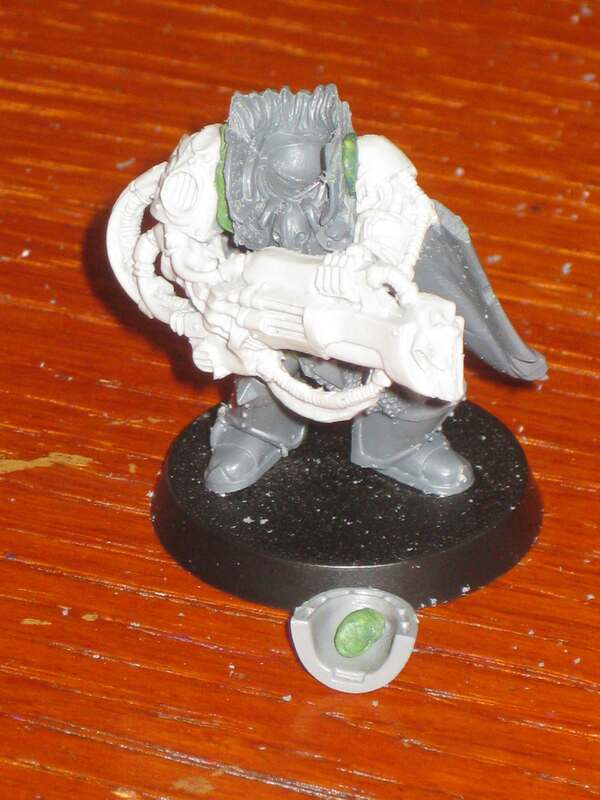 And yes, please make a "how to" for those Noise Marines. 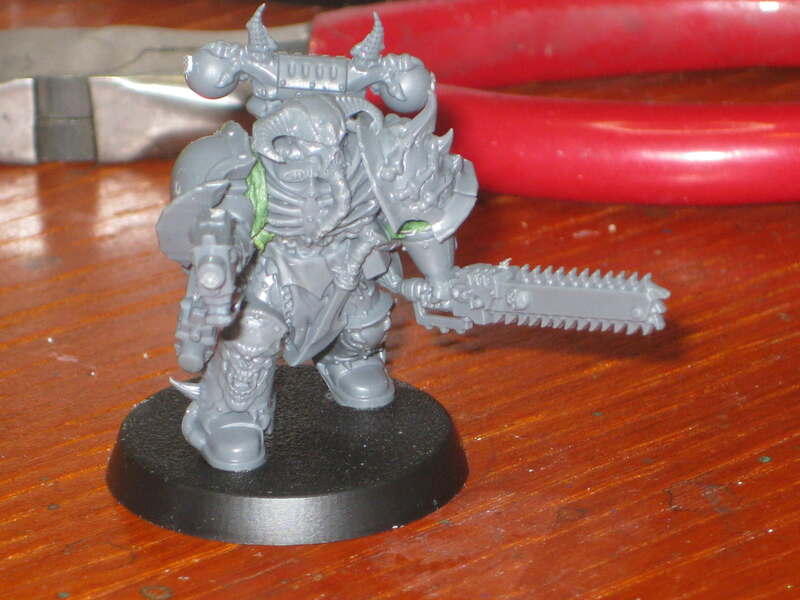 I want to make each of my Noise Marine squads different, and those Chaos Warrior conversions would be VERY nice for a squad. Edited by Gederas, 30 April 2018 - 02:27 PM. Thanks - that did the charm. I took pictures over the weekend while starting to build my new squad - I should be able to get them and some explanation up when I get home for a how to. I'm glad you like them. 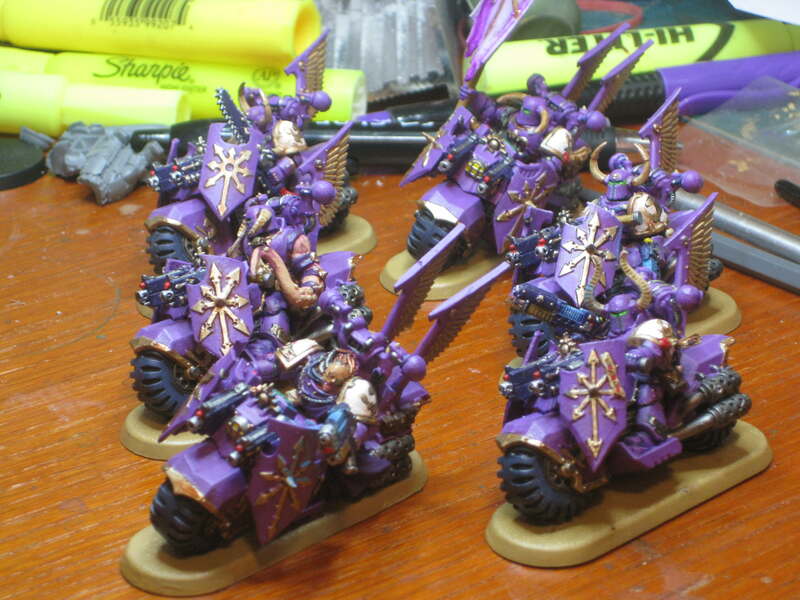 The warrior-noise marines look cracking, the cloaks give them an opulent appearance quite fitting with their nature. Thanks - that's what I thought too. Oh, and here is a pic from the back. Okay, now the "how to". 1. 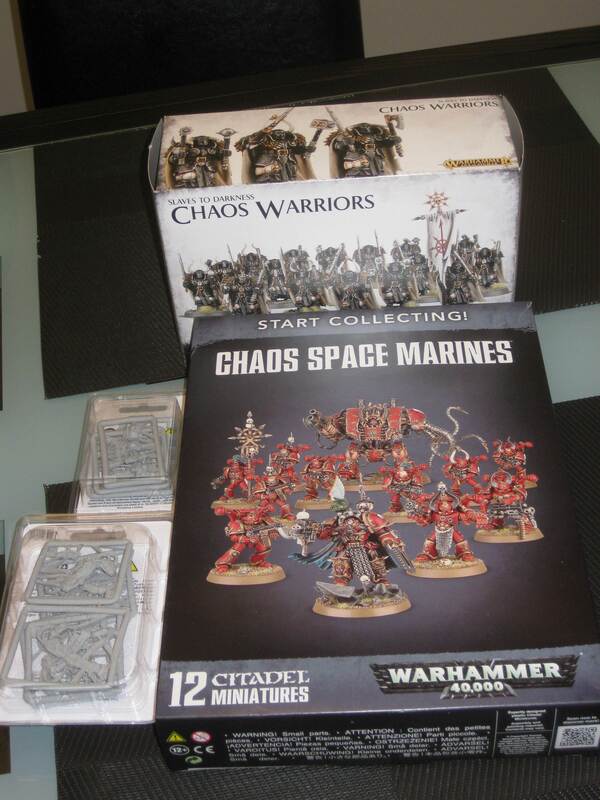 Start with these pieces and tools - you need one set of chaos space marine legs, on chaos warriors body front, one chaos warriors body back, a base, a noise marine gun + arm, plus a chaos space marine back pack, shoulder pad (1) and head (or warriors head) - I forgot to show those last 3. My preferred tool is a jeweler's saw (shown) as it allows for fine cuts and you can steer the blade somewhat to cut around details. Personally, its my most useful hobby tool. You will also need a hobby knife and green stuff (or other epoxy putty). You also need greenstuff shaping tools or a flat toothpick or similar object. 2. Saw off the warrior's legs just below the hanging armoured plates. You do this by first sawing down one side of the chain mail, and then making a cut across the leg until the 2 join. Then do the same on the other leg. This will leave you with the chainmail triangular "post" between the two now empty legs. 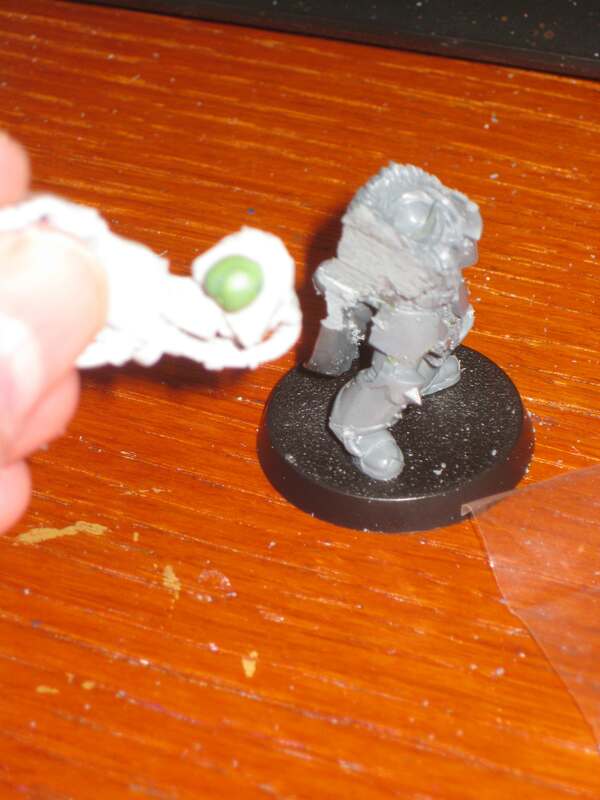 Use your hobby knife to clean up the area - if the triangle is too big, you may need to trim the back portion fit the space marine legs. 3. 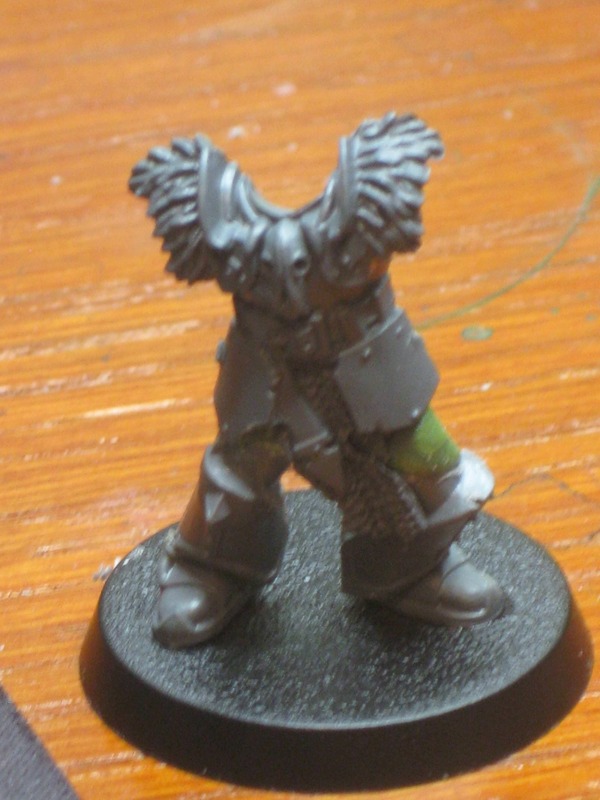 Cut the space marine legs, at about the bottom of the crotch or a bit higher. Try to have as "flat" a cut as possible - its very easy to have it slope upwards or downwards, which isn't fatal but may make fitting the legs into the warrior's piece you had previously cut. 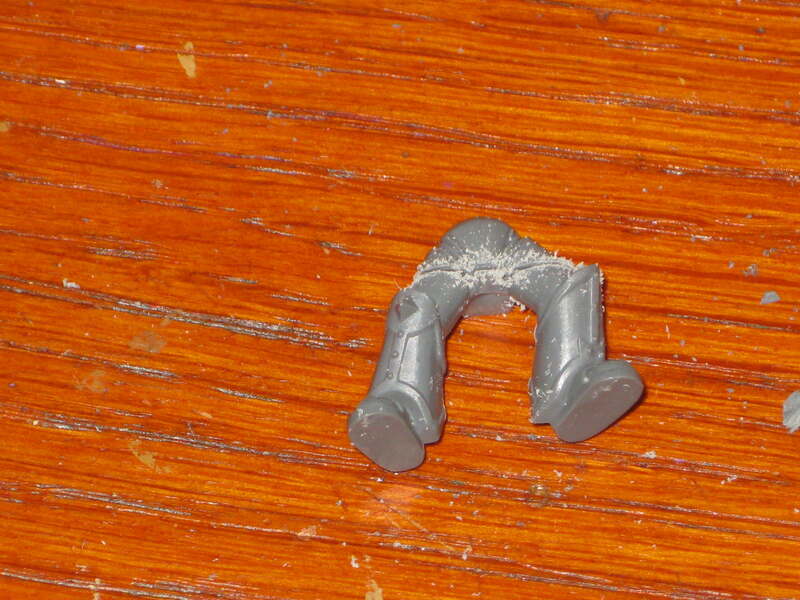 The seperated chaos marine legs. 4. 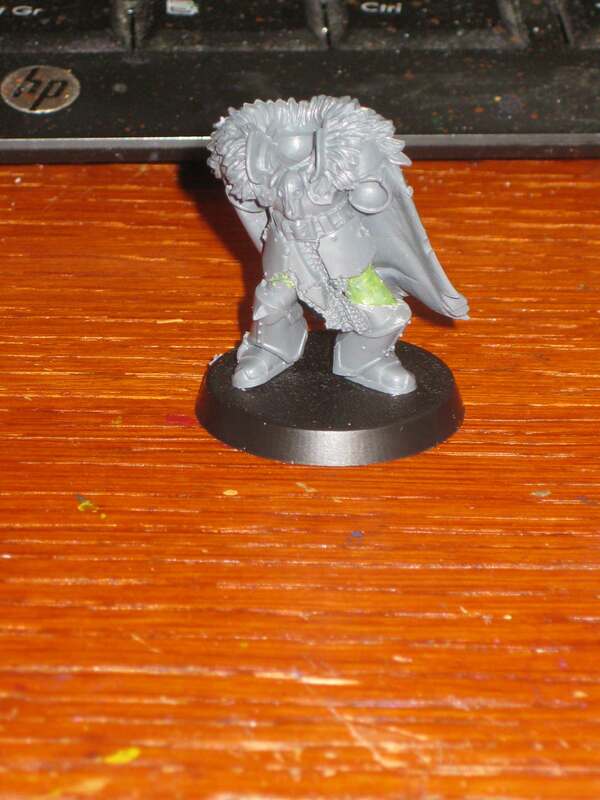 Using greenstuff, fit a chaos marine leg into the corresponding "hole" on the warrior front. You may have to cut the leg and/or the crotch a bit to get them to fit. 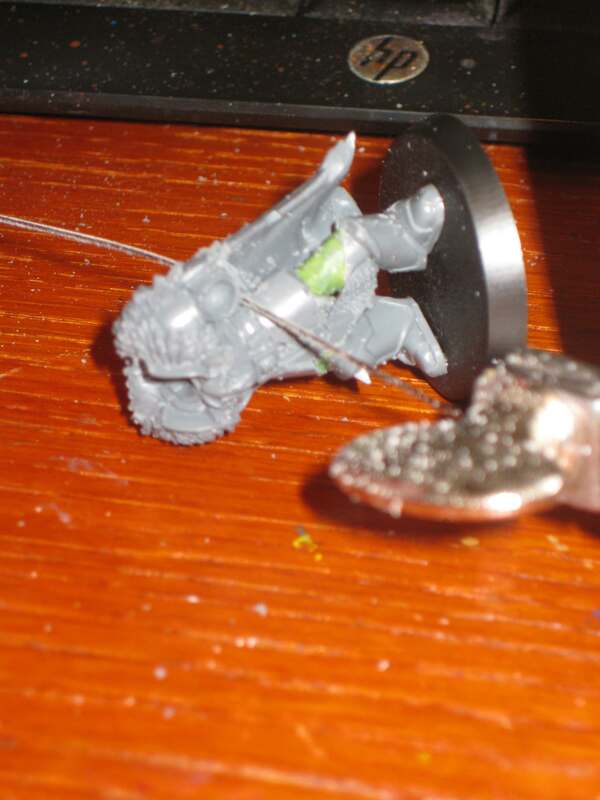 Once you have, some greenstuff has likely squeezed out the edges - trim it or push it back so it isn't visible, and smooth the green stuff to hide the seem between the 2 plastic parts. Then try it upright to see how it stands, move the leg into the desired position. You will then likely have to shape the greenstuff again, as some more may have squeezed into view. 5. Leave the leg to cure. Once it has, repeat with the other leg. Note, if you don't let it cure before moving to the second, its harder to ensure the leg stays in the position you want it. 6. Glue to the warrior front part (which we've been working on) to the base. 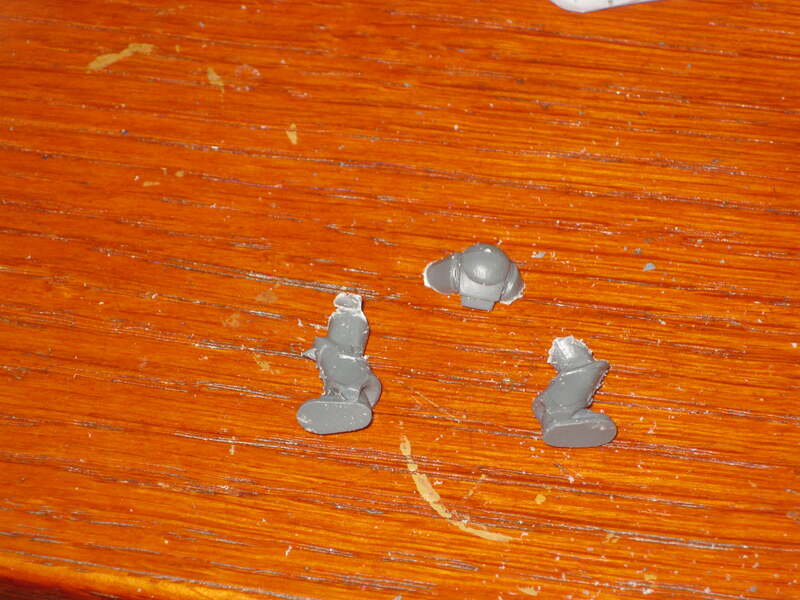 You can see that the models left leg (on our right) was cut too short, and I had to extend it with green stuff. That would have been very difficult to do had I not let the first leg cure. 7. Glue the front part of the warrior (that we have been working on) to the back part (the bit with the cape). 8. Cut just below the warriors arm back to where is joins the body. When doing all cutting, grab the torso rather than the legs. 9. Cut just beside the neck guard on the shoulder. 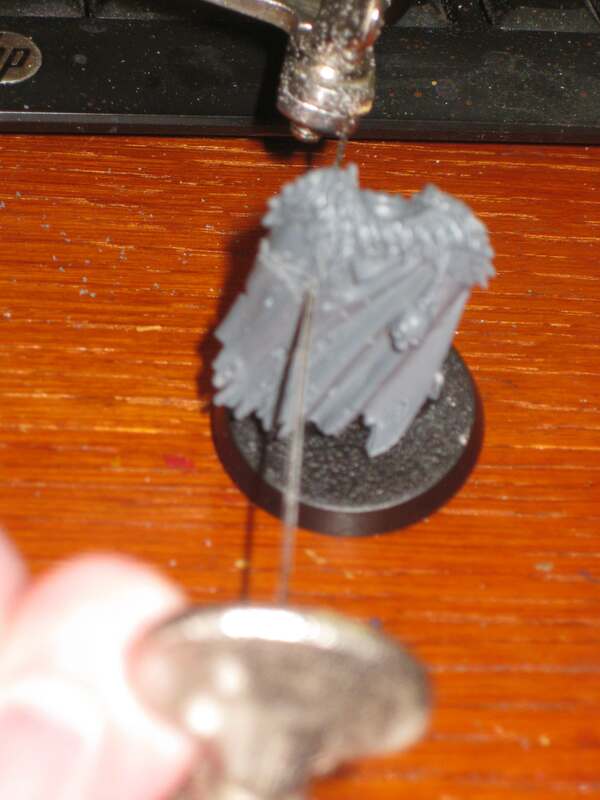 If you can manage it, have about 1mm space between the neck guard and the saw, as otherwise you will likely mangle the neck guard a little (as I did) and it is harder to cut around the round bit of armour protecting the front should pit. 10. Saw down until the cuts join - its usually easier to see if you are looking at the back. You may have to return to the sideways cut and continue it if they don't meet. 11. If your cuts meet, the shoulder should fall off. Or, if they are close enough together, you can break it off with your fingers. 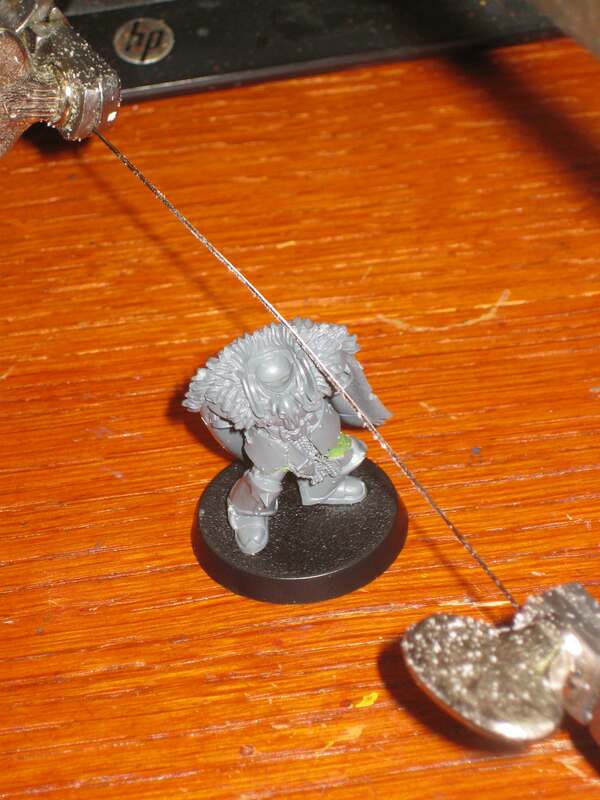 Clean up the area (such as the remaining bit of the warrior arm in the photo below) with your hobby knife. 12. Repeat those steps for the other shoulder. 13. 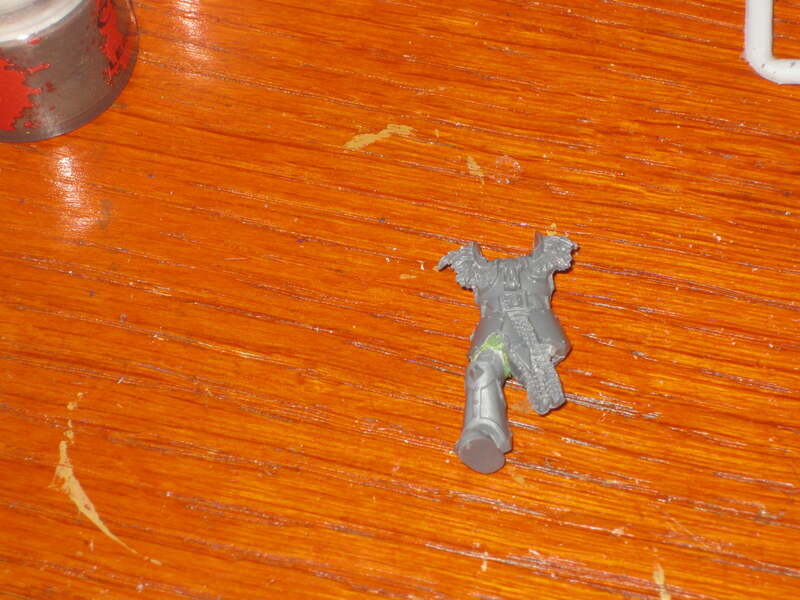 Dry fit the gun arms, then attach them to the torso using either glue or greenstuff. I prefer greenstuff, as it allows you some "flex" to pose them a bit, plus the surface from the cut is usually pretty bumpy, which isn't ideal for gluing. 14. 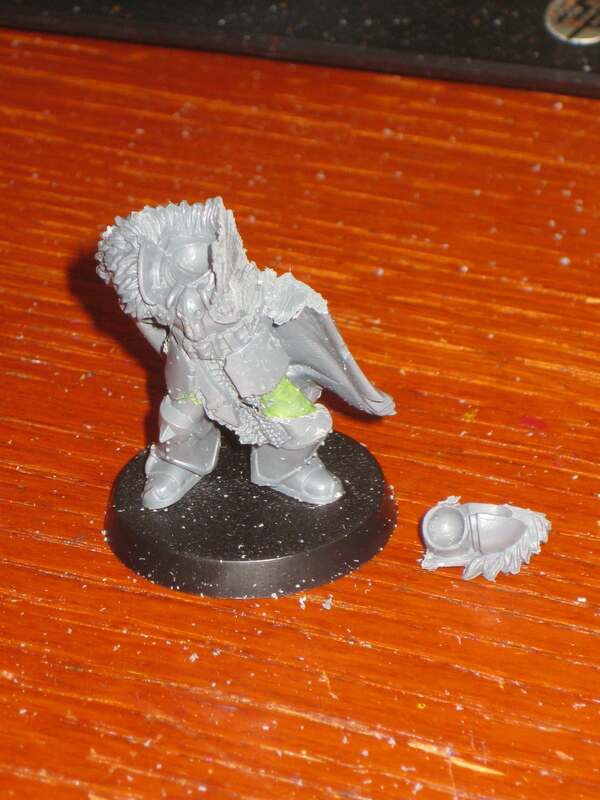 Attach a shoulder pad of your choice - my recommendation is one without much raised ornamentation, as that will be hidden by the cloak and may make the cloak bulge strangely. 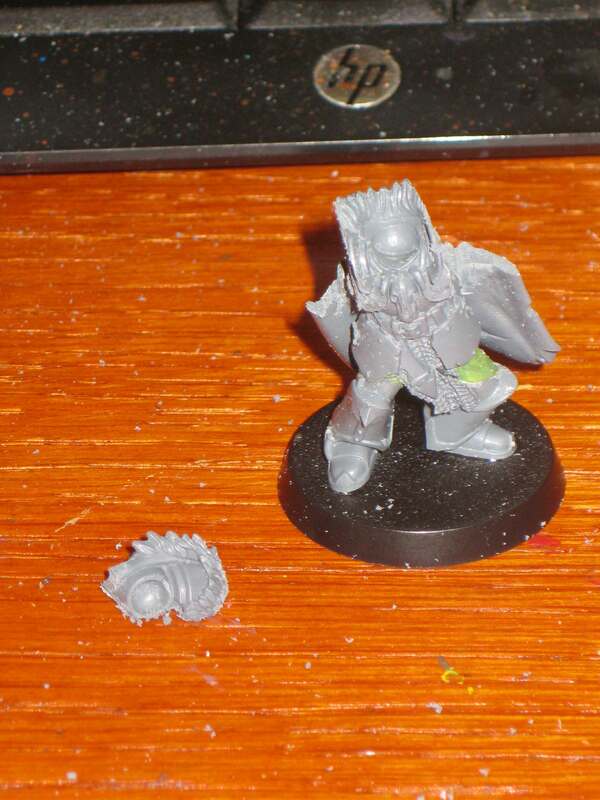 Do so with greenstuff - I find glue doesn't work well between the noise marine shoulder and your standard shoulder pad.